We started the day driving in the van to the outskirts of the city. 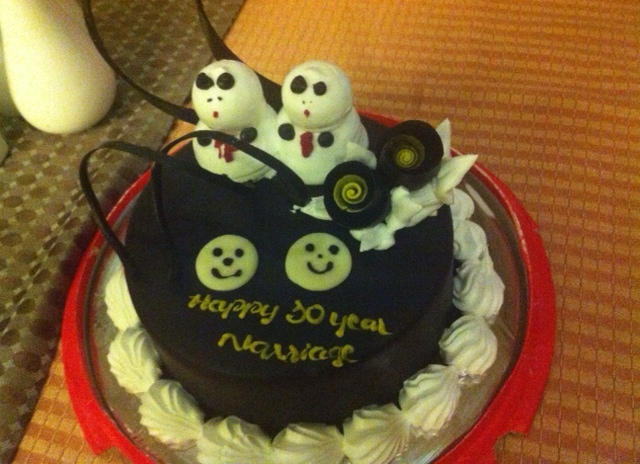 We shared with Vinh and Minh, our driver, that it was our 30th wedding anniversary. We laughed and shared stories as we headed out to bike. I was a little apprehensive about the day, hoping I could bike more easily on day three. We mounted our bikes and I tried the gears again and suddenly I was in a groove and going up the hills with ease. Once I mastered the gears I was on fire. We biked all morning on Ho Chi Minh trail. Vinh explained that what was once the hotbed of fighting during the war, with thick jungles where the Vietcong brought in weapons and tanks as they tried to overtake the south and where so many Americans and Vietnamese died, is now open fields growing coffee, rubber trees and black pepper crops. My thoughts were all over the place appreciating the beauty of the countryside and the tragic loss of life that happened in this very spot. No matter how many questions I asked, Vinh was there to answer them with grace and understanding of what I might be struggling with. Steve and I hardly ever take the easy path and this is another example of that. A bike trip through Vietnam brings with it some rough and bumpy roads, both literally and figuratively. I suppose we could have chosen a trip through Tuscany or perhaps one in France or Spain where each night we would have stayed in a charming B&B. This trip is everything and more than the comforts of home. It’s a chance to be in a place that has s history for most Americans our age and a beauty that is breathtaking at times and lacking any infrastructure at others. All the while the people are so friendly, peaceful and welcoming. Every place we have stopped for lunch, or a coffee break or to get out of the rain we have been received with kindness and warmth. This is what makes the trip incredible. After we stopped for lunch yesterday we were faced with a choice of continuing to bike for about 25-30 miles and getting in the van for the remainder of the day to the hotel or driving out of town for a bit and then biking into Pleiku, where we were spending the night. We opted for the second and drove for about an hour while we all, except the driver, took advantage of the time and slept. When we got out of the van and mounted our bikes it started raining. What’s a little rain? I thought. We put on our rain gear and we were off. Up and down rolling hills. The rain came harder as the traffic began to increase and suddenly I started feeling very nervous and a bit scared about continuing on. I flagged Vihn down and with his and Steve support we all decided that we might need to call it a day. We ducked into a roadside coffee house and waited for the van while we were entertained and welcomed by the family and patrons in the shop. We made our way to Pleiku, with a history lesson from Vihn on the way. I knew about Pleiku, because a dear friend of mine died there during the war. A bit surreal for me. We arrived at our hotel and the big bathtub was a welcome site. This was to be our night on our own and Vihn told us about a great restaurant we should go to, for celebrating our anniversary. It only seemed right that we all go. 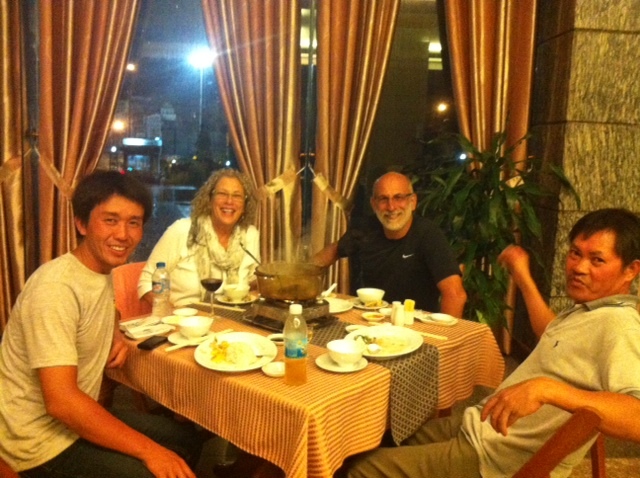 So Vihn and Minh met us at 6:30 to head to the restaurant. They were carrying a box with an anniversary cake inscribed in English “Happy Anniversary 30 years.” We enjoyed a great evening together filled with wonderful food, lots of laughter and stories about our families. This is what a bike trip can include. It is so much more than just being on the bike. Looking forward to day 4. It’s supposed to rain again and that might just mean we go off the scheduled path. Today began with some sightseeing including a trip to a minority village. We went for a “boat” ride in a hollowed out log, with a young woman standing on the back with a large bamboo pole pushing us across the lake. I wouldn’t have given it a second thought, the water was shallow and warm, but Vinh told us the night before that the lake was filled with leaches and was not swimmable. All the way across I had visions of Humphrey Bogart in the African Queen, pulling Katherine Hepburn in a boat down a river covered with leaches. But enough about that, the ride was great and we continued on with a walk through the village where you would think it was 100 years ago until I noticed all the satellite dishes and color TV’s in the huts. The country and all that has happened since we were here in a senseless war captivate me. Vinh, our guide, is amazingly knowledgeable about history despite his 28 years. He knows dates and events and is willing to answer all my questions about what was happening when and where. I am remembering my friends, particularly my friend, Nick, who never came home. Was he here, where I’m cycling through the beautiful countryside on a carefree day in August? I’m learning that bike trips are about several things. The guide may be the most important. Ours makes the trip come alive and shares freely and enthusiastically all he knows. There is no judgment about speed or endurance and the support car is there to let me rest my weary bones when I have had enough cycling for an afternoon. Yesterday we cycled all morning and it felt great. You cannot see a country from this vantage point any other way. The school children all stand on the side of the road as we pass shouting out “Hello”, waving and smiling. 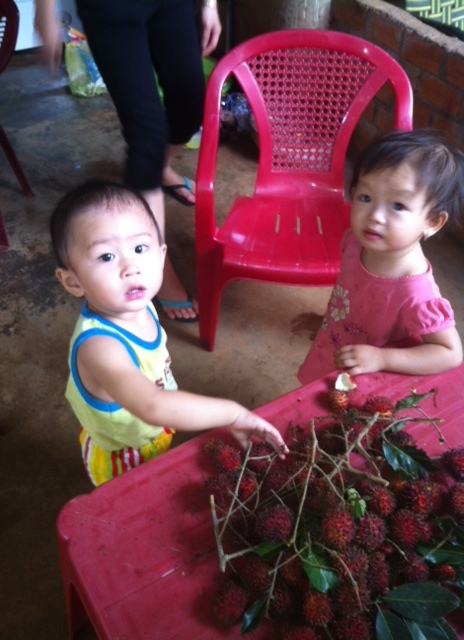 Every time we stop for coffee or lychee fruit we meet incredible people who are friendly, peaceful and welcoming. Biking trips although social during breaks and meals are a very solitary event. While I’m on my bike, I’m alone with my thoughts and on this trip that is particularly poignant as I reflect on the war. I knew when I signed up for this trip that I would have some feelings but this is amazing. After lunch yesterday I biked for a few hours and then I called it quits as I saw the very steep, long uphill before me. We were having cold drinks at a roadside stand with the support van and it just looked so inviting. Tomorrow is our 30th wedding anniversary and what better way to celebrate than with an amazing ride through the mountains of Vietnam. We are headed to the sea. Let the good times roll! We woke up to pouring rain. This is one of the first days it has rained since our vacation began 7 weeks ago. Of course it’s pouring this morning, we have the longest day of biking ahead of us. All those thoughts of why we didn’t pick a vacation of lying around on the beach are crossing my mind. We were picked up at 8:00 in a van with our smiling guide Vinh. We had met him the day before when he asked how old I was and he told me that his father and I were the same age. I assured him with confidence and a bit of bravado that I was in great shape and could handle the biking. We piled in the van with all our belongings and headed to the outskirts of the city. After about 10 minutes of driving Vinh asked if we wanted to get started. By then the rain had actually slowed down a bit and I thought now is as good a time as any. We mounted our bikes and began on a long decline down the mountains. This isn’t bad, I thought. I can handle this. We made several stops in the morning eating crickets, drinking rice wine, stopping at a silk factory, a waterfall and a pagoda. All the while we were biking on either easy slopping hills or downhill. We stopped for lunch at a traditional Vietnamese restaurant and ate enough food for a small army. I was so full when we left that all I could think of was a long nap. I asked Vinh what was ahead for the afternoon. “Some uphills and downhills and then a 10k uphill before we would be heading down to the hotel for the evening.” A 10k uphill, YIKES! We approached the first big uphill and there I was walking up the hill with my bike. My thoughts went to the 10k uphill Vinh told us about. By this point we had biked about 25 miles. It seemed pretty respectable to me. I was grateful when I got to the top of that hill and mounted my bike for several miles of slopping hills. 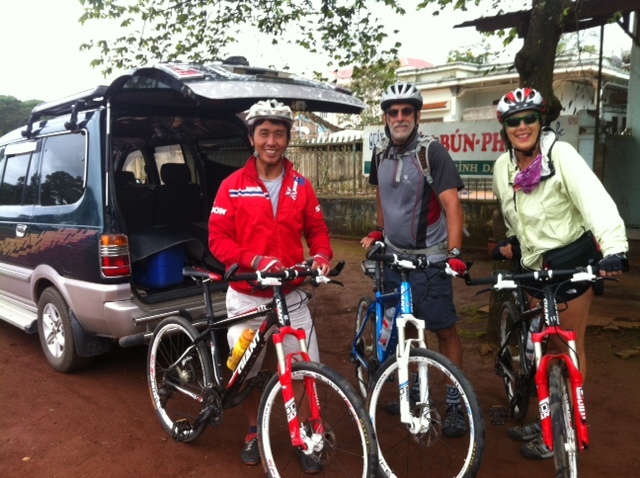 I decided I would skip the thrill of the 10k uphill and when we stopped for one of our coffee breaks I informed Vinh and Steve that I would be getting in the van for awhile and maybe would rejoin them at the beginning of the downhill to the hotel. They were both supportive and I hopped in the van with our driver Minh, who doesn’t speak a word of English. We slowly drove along up the mountain as I took in the amazingly beautiful countryside, all the while imagining what went on during the war. I asked Vinh during the day about the war and where the battles had taken place. His father fought in the war with the Americans and was wounded twice. It was a little surreal for me hearing all this and thinking about my friends who had both survived and died in this now beautiful country. Life is funny that way, bringing us around to experiences we only imagined through movies, books and stories. When we got to the top of the 10k to meet up with Steve and Vinh, they stopped biking and got into the van. We were going to drive the rest of the way to the hotel. We started down the mountain on roads filled with holes that probably hadn’t been repaired in years. Motorcycles were everywhere, some with 3 or 4 people on them and others with passengers carrying loads so large it seemed impossible to manage. There were buses and trucks and a few cars. We passed through several villages and I kept thinking about how far it would have been on the bikes. It was beginning to get dark and after an hour of driving I asked Vinh, like the kids in the back seat, how far it was to the hotel. I assumed he would say it was right around the corner. “About 40k more.” I did the quick calculations that that was about 25 more miles. Wait, didn’t he tell us at the start of the day that after the 10k uphill we would bike the downhill to the hotel? I realized that some things get lost in translation and in fact in order to complete the trip in 6 days there would be times we would be driving in the van. We arrived at the hotel about 7:45,shy of 3 hours in the van. It was dark and hard to see where we were. We were taken to our small bungalow and made plans to meet in half an hour for dinner. The room was clean and had a wonderful, hot shower that felt great. We met for dinner in the dining room of the resort and ate and talked and laughed. After dinner we headed back and I’m sure I was sleeping the moment my head hit the pillow. I’m not sure what tomorrow will bring but I imagine we will be on the bikes more than the van. At least I hope so. After 7 weeks in the States we are on a new adventure as we head back to Korea for another semester. I spent my time at home eating great food, drinking good wine, laughing with friends, hanging out with grandchildren and children. All wonderful and yet I’m ready to be “home” in Korea. We rented our island home, sold our car and I realized that for the first time in my memory, I am keyless. My apartment in Korea works with a code, as does my office at the University. No keys. What a feeling! I love the simplicity of our life in Korea and now I have the opportunity to be free of the responsibility of our home and car. I probably haven’t been this light since my 20’s when I was clueless about how luxurious it was to rent an apartment and drive an old used car that was paid for. When I talk to my contemporaries about what I’m doing, they often say things like, “ You are so brave, I could never do that.” or “Wow, I would love to do something like that—someday.” All that may be true, but I’m really not that unique. I’ve thought a lot about what compelled me to take this step, or leap, of faith and give up all that was familiar and comfortable for a life that was strange and took me out of the regional workforce and catapulted me into a world that tests my resiliency on a regular basis. One thing I have learned is that the expression “Home is where the heart is.” could not be more true. I have made a life for myself, made friends, albeit all young enough to be my children, have a job that I really do love and all this with the love of my life. That’s what jumping off the precipice is about. Although I really didn’t know all that this adventure would bring, I wasn’t clueless. I thought things through and came into the experience with an open heart and a big dose of trusting the process. 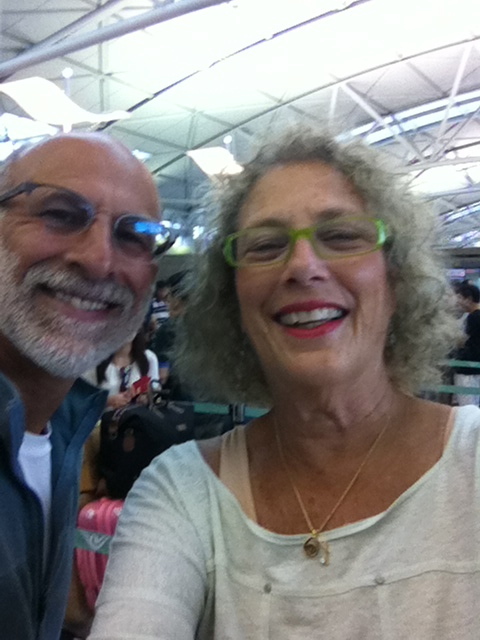 We are off for a 6-day bike trip in Vietnam with a few days at the end to relax before we head “home.” Stay in touch and I will too.